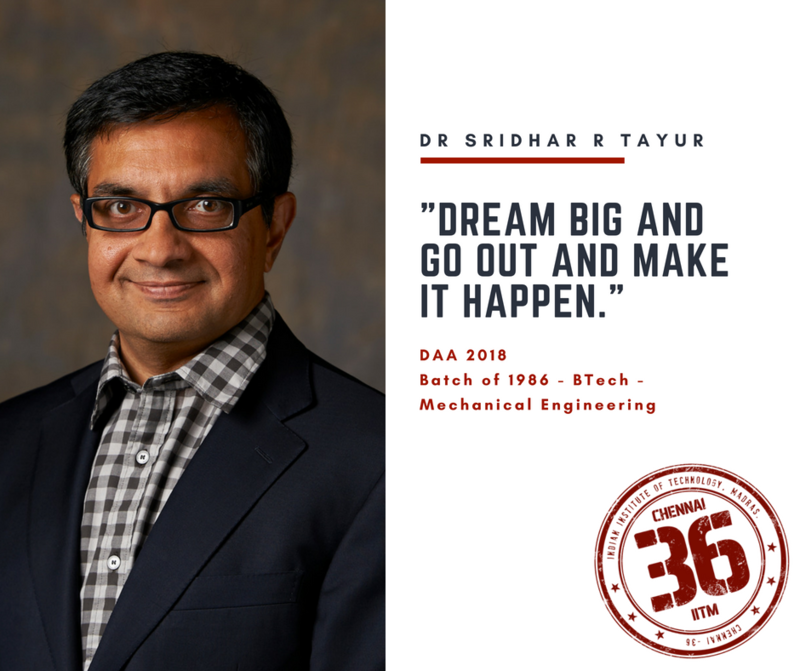 Dr. Sridhar R. Tayur, a Mechanical Engineering alumnus from the Batch of 1986 is an American business professor, entrepreneur, and management thinker. He is Ford Distinguished Research Chair and Professor of Operations Management at Tepper School of Business, Carnegie Mellon University the founder of SmartOps Corporation and OrganJet Corporation, and served as the CEO of SmartOps from 2000 to 2011. Also a proud recipient of the Distinguished Alumni Award on Institute Day 2018, he shares his life experiences in this interview with Chennai36. How does it feel to be back in insti after such a long time? Yea, it’s been quite a long time. I graduated in 1986. And for the first time, I came back in 2016 which was about two years ago. I thought I had come to a whole new universe. Culturally, it was a lot more different, because people were doing a lot more start-up stuff. I do not think I heard the word entrepreneurship when I was a student. Today I think everybody talks about disruption and things of that type. However, a lot of things remain the same. I could recognize the CLT, the OAT and things of that type. But still, it’s more filled out in terms of more hostels and more number of students. As I was joking with you guys earlier, the monkeys are still there I’m sure. You graduated as a Mechanical Engineer from the institute. However, lately, most of your work has been in Operations Research. What motivated you in that direction? So, in my undergraduate time, we had to take some electives. And I think we had to take some Humanities electives and Operations Research was considered to be under Humanities at that time. I took it and I think I fell in love with it pretty much the first time I chanced upon it. I had not heard of it before but when I saw it I thought, ‘This can be very nice!’. And I think I liked it because I could see its promise of so many applications – business applications, engineering applications, healthcare applications and public policy applications. Also, it was all Math models, so I guess there was some innate elegance of Mathematics that I was attracted to. I think when I was graduating, it was not a difficult choice, but it was a choice to be made. I had a lot of Fellowships from Mechanical Engineering schools and even there I was wondering whether I should do heat transfer or CADCAM. A lot of my friends were saying “Hey, we should all try to do Computer Science”. But, I looked at it and I asked “What do I really like?” and I said I liked Operations Research. So, that’s what I decided to do. How difficult or easy was that transition from a Mechanical Engineer to the field of Operations Research? During the first two years of the Ph.D. program, I had to “tool up” a lot because in Mechanical Engineering we learned a lot of things that are not directly related to Operations Research and Operations Management. So, I had to take a lot of Mathematics classes that I had not envisioned before. The other students in the program would have come from Mathematics background or Computer Science background so they had a little bit of temporary advantage because you know they did not do the metal cutting and engineering diagrams. But I would say after the first two-and-a-half years of taking courses and learning different kinds of Mathematics, I think it was more or less an even playfield. In the recent years under the Start-Up India Initiative of the Government of India, many start-ups have been receiving tremendous support in terms of incentives, incubation, funding, and others. This has resulted in a Start-up revolution of sorts wherein quite a few students of the institute have gone on to start really successful enterprises. So how do you perceive the entrepreneurial culture of IIT-M and how different is it from your time? In those days the main thing was “Don’t rock the boat” and do anything that is unsafe and just be an engineer in a big company like L&T or go to IIM. Basically, play it safe by joining a big company. Some of my classmates even went in and wrote the IAS and things of that type. So, it was very mainstream, so to speak. When I came back I saw IIT-Madras as a hub where they were incubating start-ups of all types and students are actually postponing their job by a year or two to join start-ups. In my time it would be unthinkable to even do those things. So, I think it has changed a lot. I think what is interesting is, when I went to the U.S, I myself never thought I would be an entrepreneur because I was mainstream there. I went there and became a professor and was not “rocking the boat” other than choosing Operations Research. Then this thing called the internet came along in the late-90s and I thought to myself, “You know what? I could commercialize some of my algorithms” A lot of my classmates who went to the West Coast had already started companies a year or two ago. So, I was not the first one but the wave was there, although it wasn’t the culture here. When I came back here in 2016, it was a pleasant surprise. What do you think IIT-M can do at the curriculum level or otherwise in order to further encourage students to go into entrepreneurship? I think IIT-M has done a lot already. I don’t know if other schools have done as much. From what I read, IIT-M is already called the Stanford of India and so on and so forth. Other IITs are jealous and are trying to catch up with IIT-M. So I don’t know what more IIT-M can do with respect to curriculum changes as, like I already mentioned, they have the incubator. And I think there are some competitions and you get some money as a seed to get started and so on and so forth. The only thing I could think about was to see and connect in a more organized way to the entrepreneurs and eco-systems in the U.S or in Israel just to bring either idea from here to a different market or see the ideas in a different market that could help in cross-fertilization in a lot of activities around the world. I didn’t see any kind of organized structural connection between the ecosystems in the U.S and IIT-Madras students. So, maybe something like that could be the next step to build on these foundations. What would be your advice to the budding entrepreneurs of IIT-M in the light of your own successful stint with SmartOps Corporation? I think you need money but the question is how much money and who is going to give you the money. My experience is many entrepreneurs actually under-capitalize. By that, I mean that they take less money than they need. Some of it is because they underestimate how long and how difficult things actually are. The second thing is, many entrepreneurs do not want to give up equity and so they want to hold on to it and they try to see how little money they should take. My view is undercapitalization is a problem because then you start running out of money because there are always things you didn’t anticipate. You then scramble in to get more money and your mindshare is not building your business. But you know without raising money you can’t really build the team and you start doing projects and take in customers who are not really good for your company. You start compromising on quality and I think it’s a good opportunity that you kind of let go waste a little bit. So my advice to budding entrepreneurs is to understand how much money you need and take a bit more maybe. The advice that was given to me was to have one good Venture Capitalist because when you have too many VCs, they start fighting with each other and get bored and that is another distraction you don’t need. Building a company is hard enough, so you don’t want money problems or VCs giving you problems. So I would say, you keep it as simple as you can. Could you talk about OrganJet and what is it that inspired you to move into Healthcare Operations and how is that the idea of OrganJet came about in the process? Interestingly, I was finishing up about ten years of SmartOps Corporation and we already had a good partner in SAP and it was quite of inevitable that we would get acquired by somebody most likely SAP. So, I think I was open to something new but I didn’t know what. And I thought what I would like to do differently was to do something in the social enterprise space. I had gone to a conference at Harvard Business School as I was a sponsor for a panel there and I thought the idea of applying business skills to solve social problems would be an interesting chapter. Therefore, I was looking to do something in social entrepreneurship rather than double down on software entrepreneurship or something like that. Then, I would say it was purely accidental that I came across this issue of geographic disparity in waiting time. So in Boston, people wait 5-6 years for a kidney and other areas may be less than 2 years. The most famous example is Steve Jobs taking a private jet from California to somewhere else for his transplant. And I thought, “What if you are not a billionaire and you still need a kidney or a liver? Can I apply my business skills to democratize this for the middle class and bring what Steve Jobs had to the middle class? What if you are a professor, a high school teacher or a regular person who does not have a private jet and a few million dollars. If you happen to live in California or Boston where the organ is not available, should you just die because you are not rich?” So that was kind of the motivation and because I had done some work long time ago with my Ph.D. student in the scheduling of private jets, I just thought, I know private jets business so well and there is so much excess capacity for the jets in the U.S. At that time Uber was not created and people called it the Uber of private jets because that’s what it is. You kind of need a kidney transplant, you kind of broadcast and somebody with a private jet shows up in 2-3 hours and takes you there and the whole thing costs 10000-15000 dollars which to save your life is not too much and you don’t have to be a villain. So, that’s how this came about. But, I think within 2-3 years of OrganJet, I have become more famous than with 10 years with SmartOps because, for one, life and death are fundamentally more important to human beings. When you do something in healthcare it is more fundamental to society. Business is good but most people view business as something you have to do make a living and if you make the business a bit better, they say “Good for you, made some money, so what?”. But if you do something that improves healthcare and provides access to things like the transplant, then that is considered in some sense as a worthy use of your energy and skills. So, today when I meet people who do not know what I did before, they think I’m an OrganJet guy and they are very surprised that I was a software entrepreneur before. Given the geographical diversity and vastness of India, do you think something along the lines of OrganJet can be replicated in India? If so, what could be the peculiar challenges one would face in India? I don’t know enough about the situation in India to make an informed statement at this time about the geographic disparity. All I know is that like the US (and many other countries), India also suffers from an overall organ shortage. I did try to understand the situation here in India because one of the things I would want to do and why I am engaged with IIT-M is to see if some of the innovations could be brought to India as well. The bigger problem at hand is the shortage of organ supply worldwide, which has resulted in the black market and other bad news of sorts, driven by the fundamental lack of supply. What I have done in the US in addition to OrganJet – and I think it is actually far more useful, having been recognized by President Obama in 2016 at his White House summit where I was invited – is using Nudge videos to increase consent rate by legal next-of-kin of the deceased who were not organ donors. That 2-minute video, done as a project first in New Jersey, now in Nevada and California, changes the chance of a person saying ‘yes’ from 20% to 50%. As an answer to the question, I would ask- can such an innovation, modified suitably to Indian culture and integrated into existing processes, be useful? I would try that first before I try OrganJet. You said one of the reasons why you still are associated with IIT-M is to ensure that the innovators in the U.S could be connected with the ones working in the social sector in India. So, where do you see the role of students from non-engineering and management background such as the Humanities background students in the process? I think in healthcare it is not just a science and technology issue. I think science and technology to help people has been there for a while. I think when we really make a difference in the healthcare to the masses, in the U.S for example, sociologists, psychologists, economists etc have been involved. I think centrally you have to make a cultural change that comes about from journalists writing about this. So to me, to make health care much more widespread, much more sustainable and inclusive because it is a basic human right, it has to include people way outside doctors and engineers. I believe the role of such people is especially large when it comes to healthcare. Finally, what would be your message to the students and research scholars of IIT-M? In line with the culture prevalent now rather than 30 years ago, I would say, “Dream big. Then go out and make it happen.” Over these years, I have tried to upgrade my ambitions to the next level. I started out thinking to keep my head down, not doing anything way too interesting. But when I began software entrepreneurship, it was fun and pushed me into believing I could do more- be it healthcare or social entrepreneurship. I am now working on Quantum Computing with a D-Wave quantum computer from NASA. If we IITM folks are not going to swing the bat and hit the ball out of the stadium, somebody else will! We should free ourselves from the self-imprisonment of low aspirations. Do we want to be just spectators (or commentators) in the game of life, or do we want to be the star players and help create the future?